This workshop will kick-off a research-based investigation into how contemporary Japanese arts have been shaped by political forces, from wartime militarism to the ‘neoliberal world order’. In so doing, we will look to identify the processes of atomization of society through art forms. Our focus is on empirical examples of internalized art productions and art currents, in juxtaposition to art expressing national/regional politics – focusing on the presence of political notions in Japanese fine arts, popular cultures such as manga and anime, and visual arts, and on the reflections/intersections between Western arts and representations of Japanese politics. Internalisation, and Political Processes in Japanese Art; Expressions of Continuity and Change. The workshop is free to attend and open to all. Registration is mandatory. Please register from the link here. The panel examines empirical case studies of how wartime art in Japan has been integral to the expression of political ideas related to national identity, regional struggle and reflective othering. The aim is to explore linkages and disconnects between these issues and their socio-political framings. The panel discusses how contemporary Japanese arts have been interpreted in East Asian and European contexts. We shall focus on how Japanese art has been shaped by political forces in the contemporary ‘neoliberal’ world order, the resulting processes of atomization in society, and the internalization of political issues through Japanese art forms. 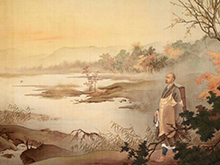 Politic Processes in Japanese Art: Expressions of Continuity and Change. The panel reflects on processes underlying the changing currents of contemporary art in Japan’s diverse social milieus: from early 20th Century modernism, pre-war nationalism and post-war Keynesianism, to the neoliberal and neo-nationalist turns. It traces a diverse range of literature and artworks that intersect political and personal lives, examining the shifting messages emerging from a broad range of Japanese art forms, including their regional significance, art’s role in Japan’s international relations and the political expression of Japanese art through various forms of media. 17.25 – 17.30 Closing remarks.